Isn't it cute? For this christening cake, we tried something new, using a mix of boiled icing and fondant. Boiled icing was used to create the wicker or basket weave look. 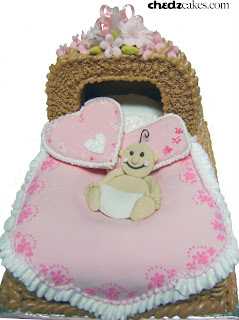 Meanwhile a replica of the baby, pink blanket and pillows were made of fondant. The baby's parents chose choco chip for the flavor.